When a pastor in a church tells his congregation that they are obligated, empowered, or enabled to keep God’s law he is mixing up the mountains. When the law was given at Mount Sinai there was such commotion due to the wrath of God that His friend Moses said “I tremble with fear.” That is what the law does is show the holiness of God and how we are unable to do this. It is not surprising when a religion such as Islam or some other of the world’s religion lean heavily upon the law. What is alarming is when a Christian Church does it. That has happened repeatedly down through the years and is what spawned attempts to reform. Now after 500 years we see the same thing happening. The limiting the nature of the law so that it appears to be manageable and something God is helping us do is quite fashionable and appeals to our inner brat. Rick Warren said “Deeds not Creeds is the new reformation. The question is how is that different from what ailed the church so many years ago? Joel Osteen has a book out in which he explains how to “Become a Better You.” This will sell like hotcakes for who in his or her right minds do not want to improve. However, one does not need to be a Christian to improve behaviour. Self help books abound in the non religious sphere and have for years. You will see on Sermon Audio examples of preachers who are caving in to this trend. These men are in traditions which historically told people how hopelessly lost are their condition and how Jesus answered the need for them. The law was put forth in all it’s crushing power. Jesus’ active obedience was proclaimed as how God looks upon anything a believer does as holy. And Jesus’ passive obedience on the cross was shown to pay for the inherited guilt we all have. The law says to “Be holy as God is Holy,” and “In the day you sin you will die.” We cannot by our means get God to save us, or once He has saved us, need Him or are able to get Him to love us more. One cannot play nice with the law. That is what caused all the lightening, shaking, smoke and commotion. That is what one will get when trying to manipulate God with behaviour. His people were just delivered out of slavery to a system of religion where gods were manipulated. Therefore a restatement of what is naturally in the heart of man was needed. Of course they said we will do it all. Not long after that the golden calf was erected and business as usual occurred. On Mount Zion we have a peaceful and well pleased God. We have the same God of course with all the same requirements. The difference is not in God but what He has done for us. Let us not grieve Him by trying to manipulate Him with our behaviour. It will not go well with those who never repent from doing so. Troubling reports to leaders of the Christian church about people leaving congregations. Flocks of people go from church to church in evangelical circles. People leave evangelicalism for Roman Catholicism. Roman Catholics in matching numbers leave for evangelicalism. What is up with that? These are days which are similar to those in the days of the prophet. The word of God is food and drink for those who love Him. We want to hear Jesus for He is our Shepherd and He promises that we would hear His voice and follow Him and run from a stranger. (John 10:4-5) So when we are given successful strategies for living instead of Jesus telling us we are hopelessly lost without Him dead on the cross we are going to look elsewhere. Today as in the past Roman Catholic’s teach we can and need to live a certain way for God to love us. Evangelicals have left the evangel for much the same teaching. They will proclaim justification by faith alone however; we owe it to God to clean ourselves up. No longer is it taught to live holy lives out of thanksgiving. It is not longer taught to serve our neighbour out of gratitude to God for serving us. We have the mindset that if something is given to us we must return the favour. But God cannot accept anything but perfection. We cannot do anything without some type of self motivation. That is the curse we have passed down from our father Adam. The eternal life we have are in the words of Jesus. Jesus said from the cross “It is finished.” That is what His people are looking for. His words that our sins are forgiven are needed every week for we sin every week. If they are not receiving the words of Jesus in one congregation off they will go to another. It is our prayer that people will find these words for which they seek. God grant that the famine not be complete in our land. 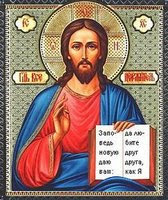 il pastor fide sola christe† Christ our only faithful Shepherd. The Bible is True Because Jesus is True. Not Vice Versa. During a recent conversation the subject of the bible being central to the faith came up. The scriptures are an integral part of the faith for sure for that is how Jesus is revealed to us. However, it must be noted that many will be quite familiar with scripture and indeed love and trust it in his or her understanding but still have it incorrect. Saul indeed loved the scriptures. He could probably quote his way through much of the law, prophets and writings. In his zeal and love for those scriptures he set out to destroy the Jesus freaks of his day. Those cultists of the Way were a plague. Those perverse teachers of lies must be stopped at all cost. At the risk of putting words in the mouth of Saul if he were to answer Jesus’ original question, which he could not of course, would he have said; “Because the bible says to?” In the law we see there is great blessing for obedience to it. Also the threatening of destruction is the reward for violating it. So he believed he was doing YHWH a solid by consenting to the death of Christians, confiscating property of some and casting them into prison was really what God wanted him to do. After all that is something of which his teachers and contemporaries were in favour. He had Jesus wrong didn’t he. In our day many profess faith in scripture. Some are making their vocation the study and teaching of scripture and could, like Saul, quote their way through huge sections of it. Many of them could do it in Hebrew, Aramaic and Greek. But they are getting Jesus wrong and doing horrible things to Christians and saying horrible things about them thinking they are doing YWHW the same solid. So what makes the difference? How is it that so many scholars will agree on what the words are and mean and still have this stress? One needs to come to Jesus to have life. In addition one cannot understand the scriptures apart from Jesus for they testifiy of Him. And Jesus cannot be come to on our own terms. The Jesus of the bible is not marketable. He is not willing to be manipulated. Christ will not serve on a panel looking to solve the earth’s problems. Jesus came to die on the cross for the sins of His enemies. To redeem them and give life to them. This makes no sense whatsoever to the natural mind. That is how the bible is gotten wrong by those who get Jesus wrong. If a person has Jesus right because he or she received Him as a gift has his or her battles cut out for them. Jesus is there with crucified and risen arms to carry us through these dark times of resistance from unbelievers, erring and false brethren. He has stacked the cards against us, brothers and sisters, for His own purpose that we take up our cross and follow Him. What a blessing we have to be able to hear His words of forgiveness and assurance, know we are His because of the waters of baptism and receive His body and blood for the forgiveness of sin and to strengthen our faith and life. One will never hear a person who holds to Limited Atonement proclaim all those in attendance at the crucifixion of Jesus eventually became believers. The forgiveness Jesus proclaimed on those crucifying Him was not the weak forgiveness we pronounce on those who offend us. This is a strong pronouncement of grace upon those who knew who Jesus is and did the strong sin of having Him crucified. In the act of atoning for the sin of the world Jesus shows it is for all people without exception. This is hard to understand that God does not hold a person’s sin against them but in unbelief they still die eternally in sin. In trying to explain this Limited Atonement proclaim that the death of Jesus is only for those who will believe. This is tossing one back on him or herself to determine sufficient faith or trust in the faith rather than the Christ in Whom we are to trust. The Pharisee thanks God for a gift He has not given. In this life we are not given the gift of sinless perfection. The same with those who claim works are sufficient to have assurance of pardon are attempting to gaze upon a gift God has not given. In thought word and deed we are constantly falling short of the glory of God. Even if a person skirts specific sins and resists some temptation he or she keeps on sinning even in accomplishing that. The inner brat will always grab onto that and admire it, parade it in front of others as proof of salvation and look to that in their mind as proof of God's forgiveness. God grant people who see things this way repentance and desire to look only to Jesus. The scripture proclaims that Jesus indeed died for the sin of every person so we no longer need look at how we believe or what we do. God grant that we always look upon Jesus the Gift that has been given for us for the forgiveness of our sin.